The Matrimonial Causes Act 1973 governs the current law on divorce in England and Wales. The law states that the petitioner of the divorce, i.e. the person who starts proceedings, must be able to evidence that the marriage has irretrievably broken down – this is the sole ground for divorce – and in addition this must be evidenced on proof of one of the following five. It is important to note that if you are the petitioner, you cannot rely on your own adultery. Adultery itself needs to be admitted by the respondent e.g. the respondent admits the adultery on the Acknowledgement of Service form or, signs an admission form. A petitioner must also satisfy the Court that he/she finds it intolerable to live with the respondent – this is a subjective test and depends on the view of the individual petitioner. To rely on this fact, you cannot have lived together for more than six months after you become aware of the adultery, if you do then you will not be able to use this ground. This is the most commonly relied upon fact for divorce. Case law provides that ‘unreasonable behaviour’ can take the form of either an act or omission and can include serious issues of physical/emotional violence or more mild incidents. A petitioner can choose whether to rely on either harsh or mild incidents – if you wish to keep things amicable, it is best to use mild grounds; you can also attempt to agree the incidents relied upon with the respondent, prior to issuing proceedings. Sometimes, using harsh examples of behaviour can make relations going forward very difficult and this is not in the best interest of the parties or any children involved. The last incident relied upon must have occurred within the last six months. NB: If you are seeking a divorce based on adultery or unreasonable behaviour, you may be able to obtain a costs order against the respondent. Desertion is rarely relied upon in practice, as the petitioner will usually rely on 2 years separation if the respondent consents to the divorce. You must satisfy the Court that your spouse has deserted the marriage and there is no intention to return. Consent is necessary to rely upon this fact. You must lead separate lives, but this does not mean in separate homes; having separate bedrooms, not socialising together and not eating together for example, can be enough to satisfy the Court. That the parties to the marriage have lived apart for a continuous period of at least 5 years immediately preceding the presentation of the petition. Consent is not needed to rely on this fact. A petition which relies upon this fact can be opposed if you can demonstrate that a divorce would lead to grave financial hardship. The divorce petition is the document which starts divorce proceedings. This document informs both the respondent and the Court the basis on which the petitioner is pursuing a divorce. The petitioner files petition – the respondent receives the petition. To issue a petition it must be sent to a Court in triplicate, along with the original marriage certificate and a statement of reconciliation. There is also a Court fee of £550 for issuing. 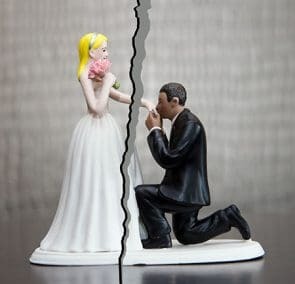 It is important to note that a divorce petition cannot be issued within the first year of marriage, however, the petition itself can rely on events which occurred within the first year of marriage. The petition is then served on the respondent with an Acknowledgement of Service form to be completed and signed – this confirms whether the respondent wants to defend the divorce. The form itself must be returned to the Court within seven days and a copy will then be served on the petitioner. Most divorces are undefended and this means that neither party has to attend Court. An undefended divorce usually takes up to six months to complete. Finances are totally separate and a time limit cannot really be put on how long it will take for these to be decided, it all depends on how cooperative the other party is, in terms of agreement and settlement. It is important to seek sound legal advice as early as possible if you are considering a divorce, as completing the necessary paperwork can be complicated – especially in terms of finances – and the filing of incorrect petitions is the most common reason for petitions being returned to Litigants in Person. If you are thinking of getting a divorce and need advice it is best to do this sooner rather than later as you will be able to advise you on the best possible course of action to put you in the best position. Call our leading divorce solicitors on 0800 437 0322 or contact us online.